Today is special for Italians. 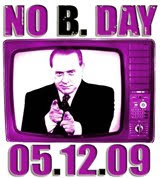 I join the No Berlusconi Day campaign. It would be great if Italian people could live without Mr. Berlusconi.